This sub tropical style garden in Kent boasts quality natural paving, striking plants including Cordyline, Tree Fern, Phormiums and various other texture rich varieties. High density trellis and clean shingle enhance the garden further. Creators of Subtropical, Mediterranean, Formal and English Gardens. 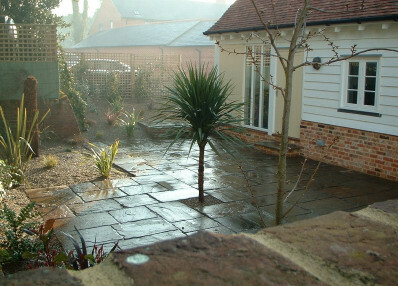 Providing garden design and construction services in Kent, London and nearby Counties.